Ever since my eczema came back with a vengeance, I've been reading about ways to heal in a holistic approach. I knew off the bat a constant stream of steroid cream wasn't going to do. After seeing my current dermatologist and being prescribed, flaxseed oil, fish oil, reishi mushrooms, nettle, and probiotics, I did some digging. While there are many triggers of eczema, gut health, or better yet the health of the bacteria in your gut can play a major role. Hence me cutting out gluten and dairy forever (RIP fresh bread and skyrr yogurt, I will always love you). Most of the supplements I was prescribed could be taken orally, I was deciding how to have flax oil every day. I love salads, but you know I need to mix it up, so dressing was out. I decided then to give bullet coffee a try, or at least my own version. Each morning I blend up coconut milk or almond milk with 2 shots of espresso (don't judge), a scoop of collagen, MCT oil, flax oil, vanilla powder, and a touch of liquid stevia. And let me tell you- it's been game changing. I'm more alert and don't feel famished from 10 AM - 1 PM like I did previously. Curious on how collagen helped my gut? - Further Food Collagen contains two amino acids, glycine and proline, that help heal the stomach lining and prevent stress-induced ulcers. Thanks to Further Food for letting me try their collagen for this recipe! All opinions are my own. Combine the sugar, coconut oil, and vanilla. Then add in the cinnamon, eggs, and collagen. Next fold in the baking powder, baking soda, and oat flour. Then mix in the coconut flour and rolled oats. If your batter isn't firm, let it chill for 30 minutes. Otherwise taking a heaping spooon of batter and flatten between your hands and place on the prepared baking sheet. Bake for 15 minutes and allow to cool on baking sheet. 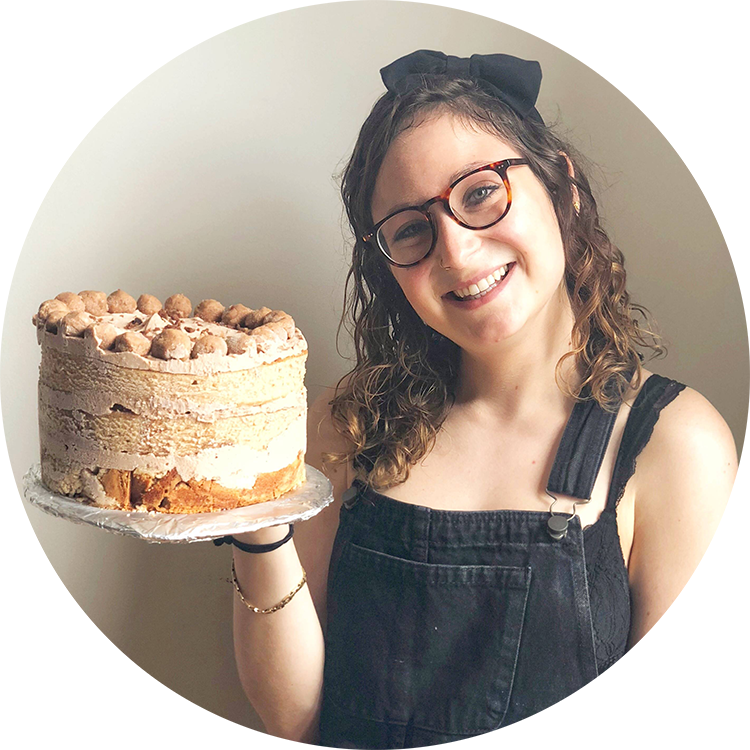 Hannah Bertiger's personal food blog, featuring recipes, commentary, and tasty images. Hi I’m Hannah and welcome to Hannah’s Bananas! Here you’ll find a mix of recipes from decadent sweets to healthy eats. I hold a Master's degree in Public Health Nutrition and create wellness programs for the corporate world. Follow me on my cooking journey and let your taste buds go bananas! Submit your email to get the PDF. Thanks! You can download the guide here. Baked with care by the cookie monster himself. nom nom nom.